New York: Thomas Y. Crowell, 1888. 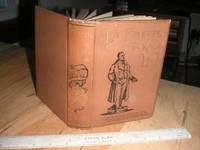 Brown cloth w/gilt & black deco on spine and covers, beveled boards, 472 pgs + b&w tipped in illustrations. Strong binding, previous owner script dtd '07 inside cover else Clean. Covers have light edge rub/dust soil. "The Knight of Liberty in Two Worlds and Two Centuries" Size: 12mo - over 6¾" - 7¾" tall. Hard Cover. Very Good/No Jacket.